JazzMutant’s Lemur touchscreen turned a lot of heads, at least as a concept: precise, multi-touch tracking that could follow all ten of your fingers independently, and interactive, custom controller touch layouts looking like something out of Star Trek: The Next Generation. That was the good news. The bad news: difficult assignments for OpenSoundControl (OSC), extra steps required for MIDI (especially in the early versions), controller layouts limited to pre-defined objects, no tactile feedback as with physical controllers, and a steep price (US$2500). Some dedicated electronic musicians loved it, and were willing to put in the time to use it. Many others just shrugged and stuck to far-cheaper, sometimes more-flexible hardware knobs and faders. Still, many at least acknowledged that the Lemur could be a first indication of the future of hardware, even despite its flaws. Now, JazzMutant is back with something they call the Dexter? All-new hardware, right? Nope. The unit itself looks identical to the Lemur, which is too bad — part of what made the Lemur experience feel incomplete to me was its bulky and boxy case, which failed to reflect the innovation of the screen. A lower price? We just don’t know yet: pricing and availability is TBD. 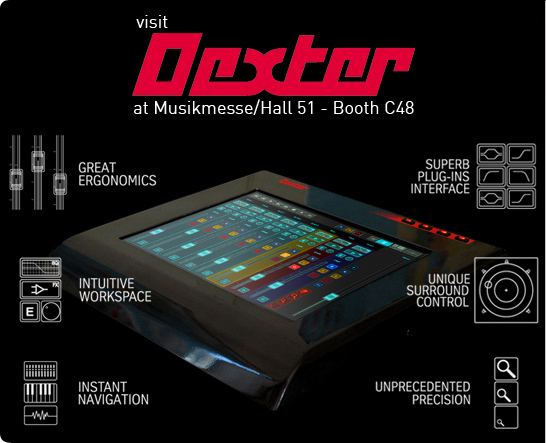 What the Dexter is designed to do is to work more fluidly out of the box as a traditional DAW controller. There are pre-defined layouts for Cubase, Sonar, Logic Pro, Nuendo and Pyramix, and lots of new object features specifically designed to DAW editing. Track navigation: “The Track Edit mode offers a clear overview on all the parameters of an individual channel, including graphical EQ display, effects editing, bus sends, and surround panning.” Great, but mixing isn’t just about mixing — it’s about editing, too. And this gets back to the original limitation of the Lemur: because it’s an interface, not a screen, you wind up having to navigate your computer screen anyway. And physical control surfaces can still do editing. Flexible layout: One definite advantage of touch-screens is additional flexibility: “… press the Â«View SoloÂ» button to display only the soloed tracks on the screen. With Dexter, channels you don’t need never get in your way.” That’s good, but track groups and a motorized control surface can do the same thing. Multitouch EQ: Now this is immediately cool. Using multi-touch, you can directly interact with EQ settings. The only issue is, most people are happy with conventional controls, and EQ workflows for engineering generally require the exact opposite of what Dexter does: normally, you’re fine-tuning individual bands in small increments, not because of the limitations of hardware, but because that’s the best way to get accurate results. Multi-Touch Surround: Surround applications are to me the single most intuitive application of the Lemur and Dexter, and the new surround applications don’t disappoint. “Sound sources can naturally be moved around using the tips of your fingers in the most intuitive manner. Dexter also introduces novel ways of reshaping the whole surround soundscape through simple finger gestures. Rotation of all your sources can be achieved by manipulating the panner just like a spinning vinyl ! Drag two fingers apart to spray all sources away from the center.” Here’s where both multi-touch interfaces make sense to me. Whether JazzMutant is the future of surround or not, I think a lot of the innovation you see in surround will have to do with interface (both on the hardware and software ends). Zoomable Faders: “You can now tweak in real time the resolution you want to acheive from one controller. Â«Zoom inÂ» on your faders when you need that extra bit of precision in a mix. Â«Zoom outÂ» when you’re looking for the widest range achievable. Dexter brings matchless precision to your mix that top-of-the-range physical faders just can’t compete with.” Fascinating — but do you really need this? Because volume changes are logarithmic and there are limits to human hearing in subtleties, I think I’d actually prefer a physical fader. Has anyone ever felt like volume faders on an analog mixing board, for instance, didn’t give them enough control? It’s all an interesting re-imagination of applications for the Lemur. But to me, the strengths remain doing things that couldn’t be done before. Surround is squarely in that category, and sounds like it’d be plain fun for performance. It’ll be interesting to see price. But as Apple unveils the iPhone, you have to wonder how much longer JazzMutant will be the only multi-touch game in town — and, for that matter, with new conventional and non-conventional tangible hardware and haptic technologies on the horizon, always whether multi-touch alone is really the final frontier for control.